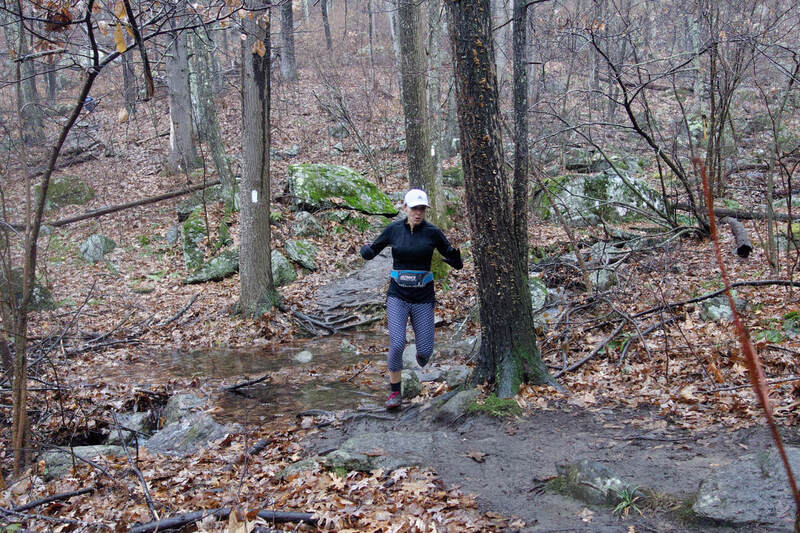 ​The 3rd annual Schaghticoke Mountain Race brought inclement weather again. 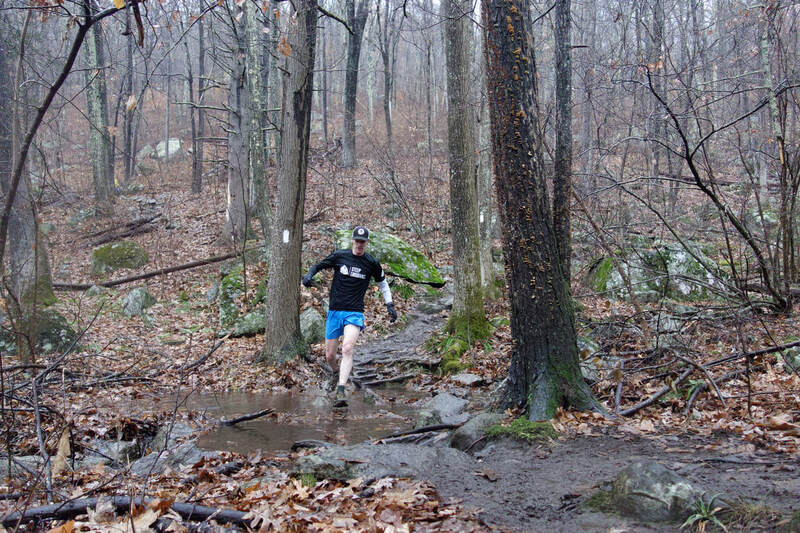 Rain overnight and into the morning brought a somewhat muddy track this year, but generally pretty good conditions for us hearty group of trail runners. Thanks to Ken Berardi for helping with blowing the leaves off the entire 1.5 miles of trail the day before! 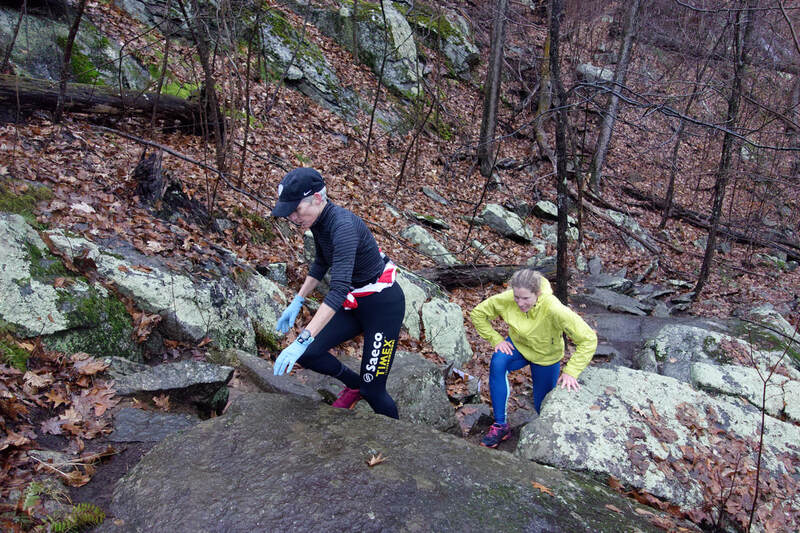 After a few last minute drops and scratches, we settled with 24 runners (18 men, 6 women) at the start. Runners went off in 20 second increments again to keep with the time trial like format for the race. 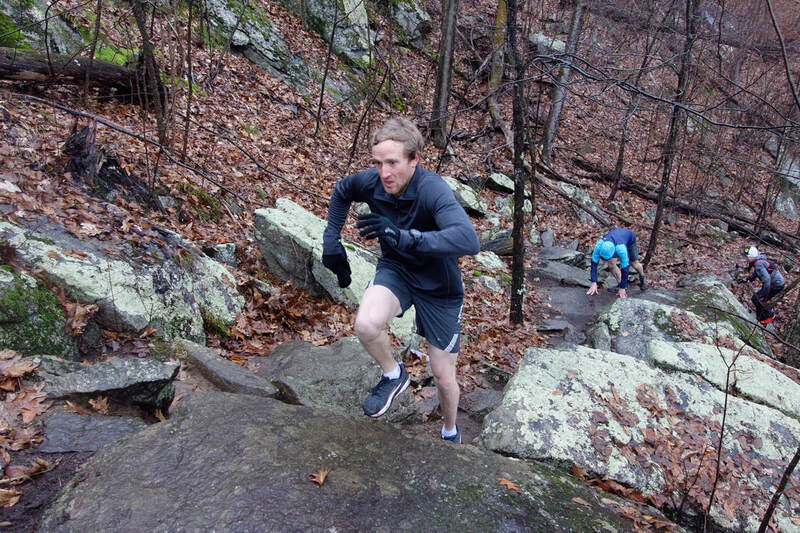 The race is simple...an uphill race of 1.5 miles up the mountain with an elevation change of nearly 900'. Runners then wait for everyone to gather at the top and then another race, this time going downhill on the same course. 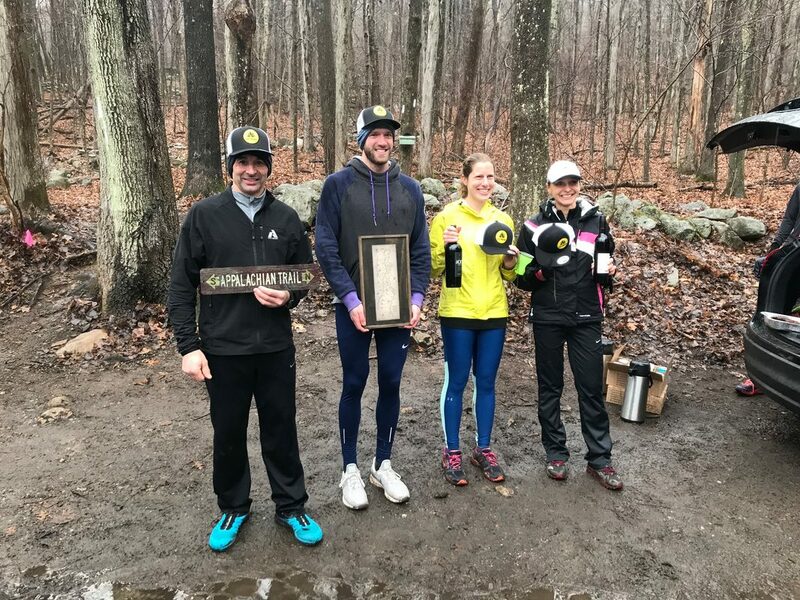 Both returning champions were not there in 2018, but that left the door open for James Boeding, a former college cross country runner from Bowdoin College to crush the uphill in 15:14, just 11 seconds off the course record of 15:03 set last year by Mike Nahom. James was the favorite, hence he started last, and was able to make up the stagger on Luis Francisco who started just 20 seconds ahead of him. Luis was second in 16:20. We had 15 runners dip under the 20 minute mark including women's champion Alison Masopust in 19:09. She was followed closely behind by Elizabeth Vogt in 20:10. Once at the top, the weather was decidedly much cooler and quite windy. We gave everyone a chance to catch their breath and we were ready for the 2nd half of the race. Runners again staggered every 20 seconds with the fastest guy on the uphill going last. 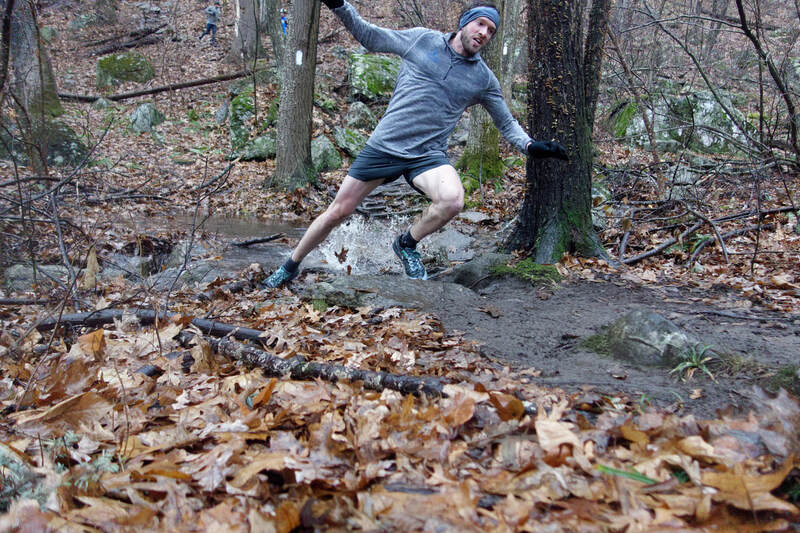 The downhill off Schaghticoke Mountain is technical single track on a dry day, but even with the mud and slippery rocks, that didn't stop the runners from hurling themselves down the trail! James Boeding again proved dominant on the downhill section in 10:42, just under 40 seconds off the course record of 10:03, by Ryan Hall in 2017. Michele Zandona, super quick on the technical stuff, garnered the women's crown on the downhill in 13:30! Thanks to Alene Lofink and Jacob Bergmeier for taking photos/video on the course. Photos can be seen by clicking on this link. Hope to see you all next year!